THE SOUL'S PATH IS NOT STRAIGHT AND ORDERLY; IT'S WINDY AND OFTEN BUMPY, BUT IT HAS AN INCREDIBLE VIEW. There was a time (not very long ago) where the thought of unplugging terrified me. Not only did I always feel on call for my kids, but physically leaving them meant calling in a lot of support. Grandparents would fly in, friends would help with carpooling, and I would write endless lists of how our routine worked most successfully for those who were there to help. It was a logistical overload. Taking time away not only felt like a huge project, but even worse, it also brought up so much fear and anxiety. And, I desperately needed a break. Over the many years of leading my annual international women's retreats, I began to learn how to manage this inner battle better and better. The personal value and insight I received with time away is something that can still bring me to tears. On one early morning during a Bali retreat –– at approximately 4 am, while sipping Balinese coffee and writing in my journal –– I realized how I had been holding onto so much shame, feelings of not being enough, feelings of not being worthy, for far too long. I, in turn, made some big manifestos to myself that morning, promising myself I would learn how to break free from these old beliefs and patterns, that I saw were so clearly holding me back. As you can imagine, I had some inner work to do, so that a new way of being and thinking would gain a solid foot hold in my life. To this day, if I notice myself slipping back into those old thoughts and loops, I catch myself much quicker. I tend to the triggers. I know better how to flip my script, so to speak. I am sharing this with you because I know we all have our blocks in taking time for ourselves ––large or small, near or far. My women's retreats have become a perfect way support many women in transforming these blocks, and I now know in my bones that this is my calling. I support women (like you!) in taking a break, creating time for reflection and getting out of your day-to-day stressors –– to create some space exhale. I want you to know that all of your efforts in preparing to get away –– from prepped meals for your family, to play-dates for your kids, to delegating your work, to simply letting go of control –– are all worth it. In fact, every single to-do that gets you closer to taking a break and being with yourself in an intimate way is priceless. I have many upcoming retreats (see below) because I want you to have options, and I want the right retreat to speak to you. 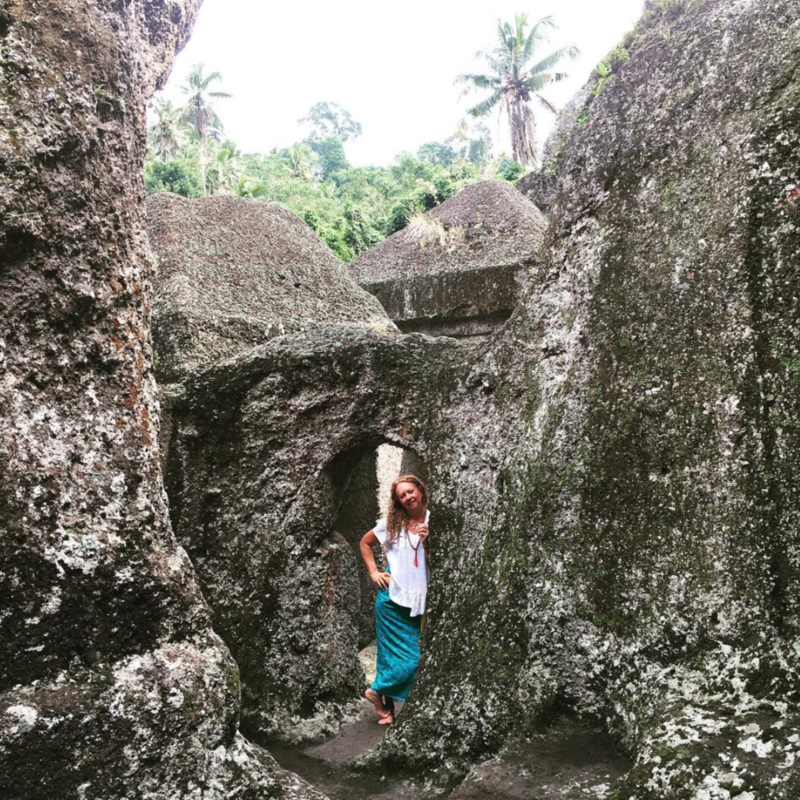 I am featuring our upcoming Satiate Your Soul ~ Bali retreat because, if you can join me, I know this trip will knock your knee highs off. 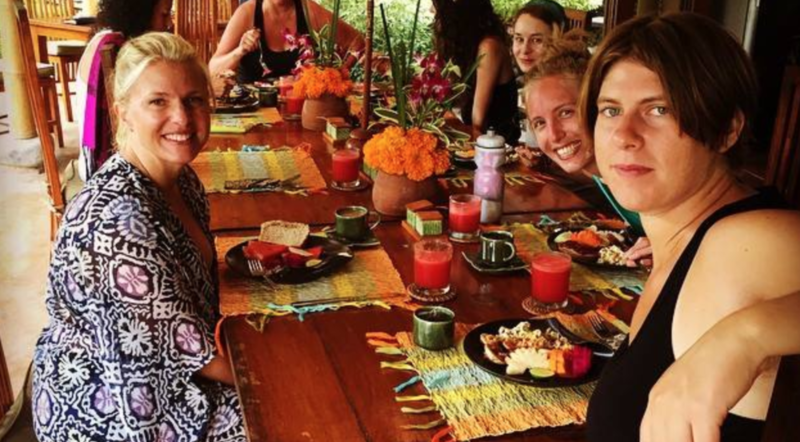 Join The Satiate Your Soul ~ Bali Women’s Retreat: Experience a week of nourishment from the inside out where you can live your organic rhythm, connect with like minded adventurers, and step into an experiential and cultural immersion in the sacred land of Bali. 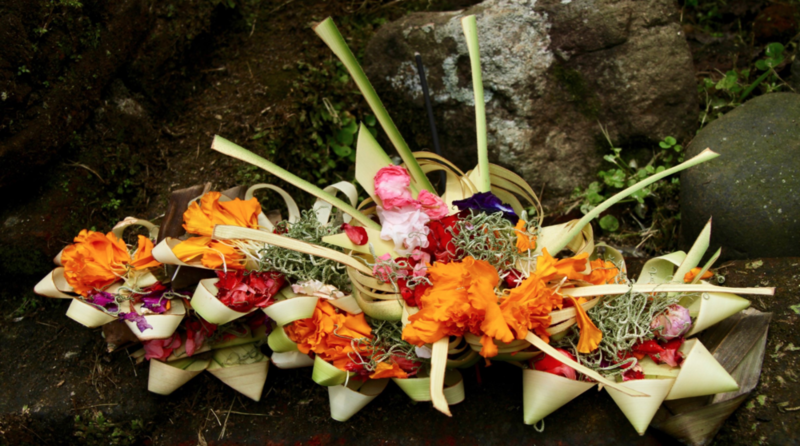 Immerse: Enjoy the culture through ritual + Balinese dance + food + goddess study. 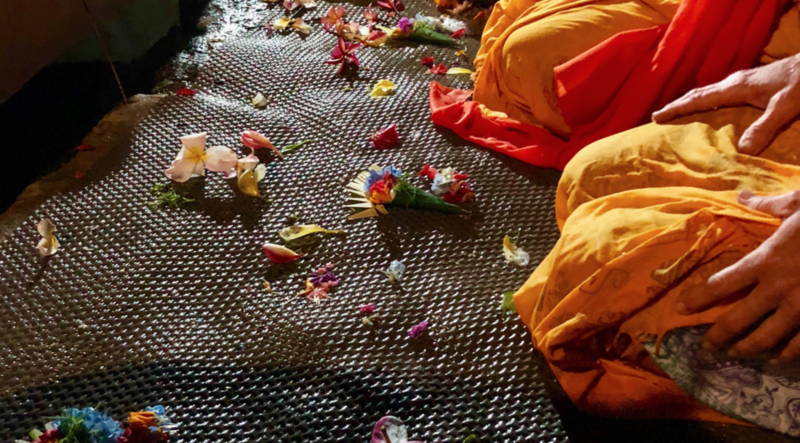 Join us in experiencing this very special and intimate Bali retreat illuminating the devotional and cultural aspects of Bali through the feminine. Also (and reminder) to give you a little taster of what I teach on this retreat, I want to share with you The Soulful Superfood Series. A *FREE* online experience to satiate your soul. You can join HERE. Trouble getting your kids out the door to school (along with the morning melt downs that come with)? A little too much snooze button? And then, to top it off, breakfast...the most important meal of the day? Seriously? There are some important aspects of what to eat to ensure a healthy breakfast and a few important science-based reasons to avoid skipping breakfast. I thought I would share some with you today (along with some easy and healthy breakfast ideas). 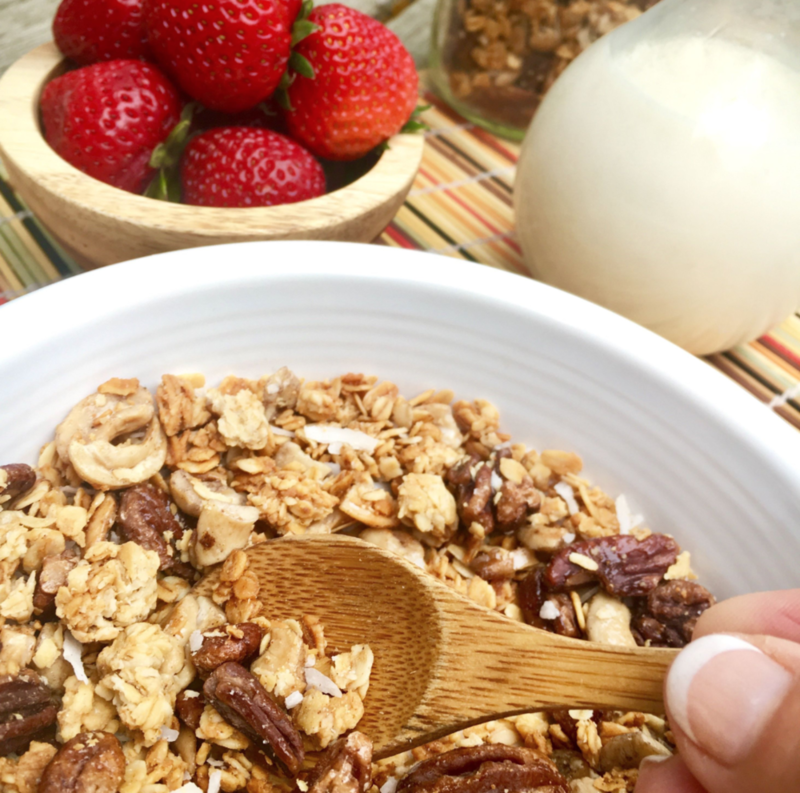 HOW TO EAT HEALTHY BREAKFASTS ON BUSY MORNINGS? Try simple protein-based green smoothies for busy mornings (avoid frozen or super cold breakfasts as they are hard on your digestion. Simply warm up your frozen fruit a bit before blending). Choose well rounded plant-based or animal proteins to boost your metabolism and elevate your energy. Dinner for breakfast? Absolutely. Warming soups and broths do wonders for your digestion in the morning and are often packed full of veggies to boot! WHY TO NOT SKIP BREAKFAST? Skipping breakfast is linked to weight gain, migraines, brain fog, afternoon drops in energy and of course a hangry attitude that is more irritable, short-tempered and cranky. Ultimately, there is no one-way approach to health and vitality, and for the occasional person, skipping may work, but almost everyone (biochemistry included) feels better with a smart and satiating start to the day. 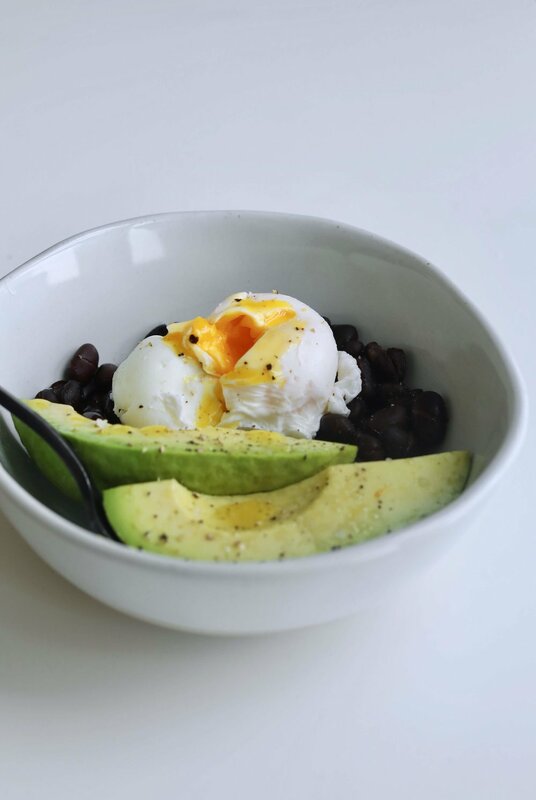 If time and efficiency in the morning are your biggest breakfast obstacles, be sure to scroll down and explore some of my favorite simple and satiating breakfasts. I have you covered! P.S What are your biggest morning challenges? Tell me in the comments below! LET'S TALK ABOUT LEAKY GUT! 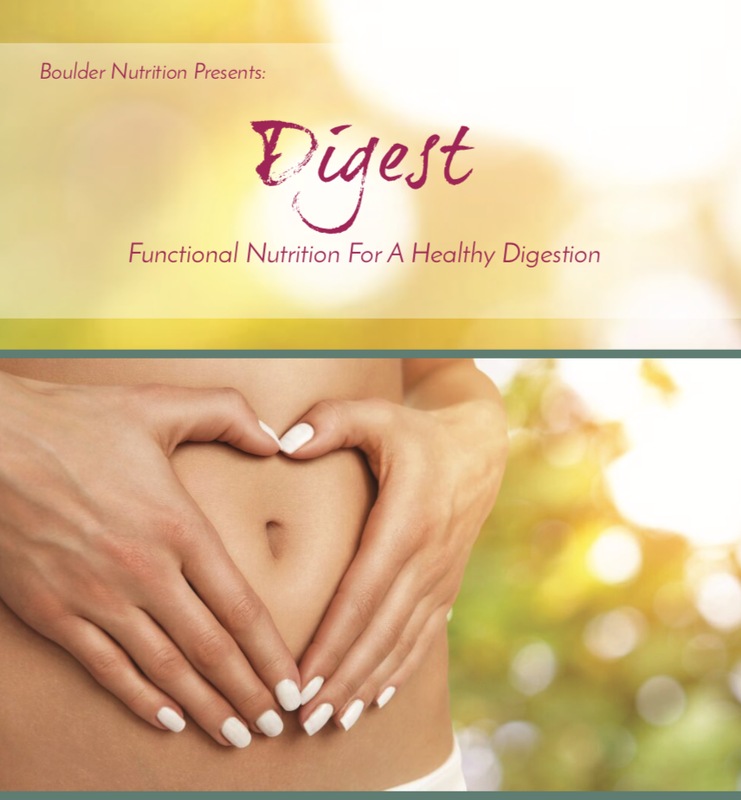 If you have been keeping up with trendy health blogs and magazines you have probably heard of this digestive phenomenon. I prefer to call it gut permeability (which is exactly what it is). Here's the deal Sparkle, the overload of foreign substances we are exposed to on a daily basis take a toll on the health of our digestive lining. With the decline of the American diet and rise of digestive distress–– including candida, food allergies, chronic stress, pesticides, chemicals and more –– the seals of tight junctions in our gut lining can become permeable (not preferable for a healthy and strong digestion). When this happens, foreign substances and food particles that are meant to move through the GI tract to be excreted can end up leaking into the bloodstream, causing the immune system to build a reaction (or antibody) to the foreign substances it cannot absorb. This is commonly known as leaky gut or gut permeability. Consequently, your digestion does not absorb or assimilate well and these reactions in the blood can cause further damage, such as systemic inflammation, autoimmunity, weight gain, joint pain, fatigue...and more. First, you may be wondering how you can tell if you have leaky gut? If you are diagnosed or suspect any of the following you most likely have some gut permeability (leaky gut). Want the science? Leaky gut can also be assessed through the Lactulose/Mannitol test. These two different sized sugar molecules are excreted in the urine which reflects absorption from the gut and is a reliable representation of gut permeability. While “leaky gut” sounds like a disturbing diagnosis, many, many folks suffer with this very common digestive weakness. The good news is, it is completely reversible. Second, you may be wondering how can you heal leaky gut? 1. Remove the digestive irritants triggering leaky gut (candida, food allergies, toxicity, chronic stress etc). 4. Reinoculate the good bacteria. 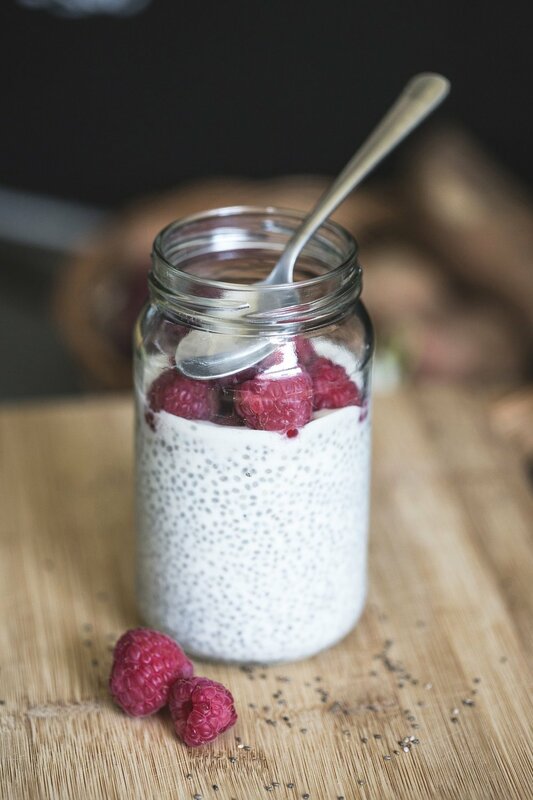 Once the digestion is back into homeostasis and working order, inflammation is diminished, and the trigger foods are removed you can replenish the good flora to improve the health of your microbiome. I would be honored to support you! P.P.S. Because this is the premiere of my new program, I discounted the price generously for you! I hope you enjoy this amazing opportunity. My inbox is overflowing with New Years hoopla! From the latest cleanses and rituals, to travel discounts and retail deals. Although I love a good cleanse, a groovy girly ritual and a bargain on a cute pair of shoes, I have this decided this year, to practice contentment with what I have on the outside and amplify the ways I nourish myself on the inside. A new year often highlights the places we feel like we are at the mercy of our lives, our circumstances and the world at large –– where life can feel like it is happening to us rather than being created by us. Nourishing ourselves from the inside out includes tending to our bodies wisely, learning the vast landscape of our minds (and how the quality of your thoughts can either support or hinder us) and giving ourselves the spaciousness that we need to digest our lives. While I was hesitant to add to your overcrowded your inbox, I also really want to share with you some nourishment principles to support you in deep self-care, conscious attention to the many aspects of yourself and some ways to help you process the busyness of daily life (which will likely be returning in these coming days, if it hasn't already). In celebration of a brand-new year before us and the debut of my new program coming soon, I created a FREE video series for you called NOURISH. Learn what YOU need to fill up your cup for optimal nourishment customized just for you! Create a daily rhythm and structure that supports all you want for yourself. Most of all, learn how to start exactly where you are with your wisdom, sovereignty, and empowerment lighting your path. These nourishment principles are some of the foundational elements from my new program DIGEST. If you are ready to make a tangible change in your health and your life, take note that registration is opening in just a few days!. Did you miss episode 1? No worries, you can watch it here. I hope you enjoy today's episode, and I look forward to sharing DIGEST with you soon. Who said salads have to be raw? Try this wonderful wintery version of a salad that eases the digestive burden on your system, includes some more seasonal winter veggies and is chock full of phytonutrients to boot! Our bodies digest foods at approximately 100 degrees. Foods that are ingested at a cooler temperature (frozen or raw) add a digestive burden to your already taxed system. To relieve your digestion and create a healing and soothing environment for your digestive repair eat primarily cooked or warm foods. Need a little sweet treat? We brought these delicious little bites on the Grace and Gratitude Retreat this November and they were a huge hit. In fact, there are a few participants eagerly awaiting this recipe as we speak! This one is for you if you love a little sweet treat, but want to skip the sugar. Chock full of coconut oil! There are few substances on the planet that stand up to coconut oil. This versatile superfood has beneficial uses that span skin care, hair health, and anti-inflammatory properties—benefitting you inside and out. Coconut oil is antibacterial and antimicrobial, making it a wonderful addition to your menu. Notably, research shows that eating coconut oil regularly can support and heal your digestion as it positively influences the delicate balance of good and bad flora, making the plethora of antioxidant-rich foods you eat, easier to absorb. There is nothing quite like a warm bowl of soup during these wintery days and nights. The bone broth base provides a hearty dose of protein, tons of collagen and amino acids to support digestive repair and deep nourishment. The zoodles (spiralized zucchini noodles) are a wonderful substitute for the more common noodles. While you may have heard a lot about bone broth, tasted it at a local health food store, or from your grandmother's soup pot, you may not realize that not only is it super simple to make, but it is also a medicinal nourishing tonic that can make a really big impact on your health. Bone broth is becoming so popular amidst recent health and wellness trends for a few very important reasons. The most effective and healing ingredients in bone broth are the amino acids – glutamine and proline. If you suffer from food allergies, leaky gut syndrome, autoimmune symptoms, or IBS, bone broth is for you. Glutamine is one of my favorite supplements for healing digestion (more in module 3), inflammation while rebuilding and strengthening the digestive wall (which gets thinned and often permeable during digestive illness). A regular dose of bone broth will do wonders for your digestion. THE BEST WAY TO EXPRESS YOUR GRATITUDE IS TO ENJOY ALL THAT LIFE GIVES YOU. About 25 years ago I was gifted a Tarot deck while I was backpacking around Central America. You may laugh, but have kept this same deck nearby since then. The above quote was written on one of those Tarot cards, the very one I pulled out of my tattered old Tarot deck just a few years ago on Thanksgiving day. ... At times I have felt guilty for taking pleasure in the successes and the luxuries that I do have. ... Often, my mind has automatically turned toward self-criticism, imperfection and focussed on the negative, rather than celebrating my health, abundance and joy. ... Once in a while, I've noticed when I receive a compliment or an acknowledgement, I have a hard time taking it in, but rather brush it off as not true or an exageration. For many of us, receiving pleasure and celebrating the good in our lives is takes practice. But, I’ve also noticed that elevating daily gratitude and pleasure gets easier with time, practice, frequency and focus. While the Thanksgiving holiday accentuates gratitude, the science behind gratitude has many diverse and positive effects that go far beyond Thanksgiving. Gratitude Improves Our Patience: Research shows that practicing gratitude can increase your internal well of patience and keep you more calm and centered in yourself. Gratitude Improves Our Eating: Gratitude is a positive state of mind. Gratitude fills your body with loving thoughts, positive intentions, and reverses judgment and criticism (of self or others). Gratitude not only makes us happier, but healthier as well. Gratitude Improves Our Self-Care: Gratitude is the perfect ingredient to boost wellness-based activities and self-care. One study found a positive correlation between practicing gratitude and focusing on healthy behaviors such as diet and exercise. Back to you! What are you most grateful for? How are you enjoying these elements in your life? Eat well and happy Thanksgiving! P.S. Calling all Coloradoans! I just opened registration for a local day retreat this December - ENVISION - for those of you who want to consciously create your 2019. Join me December 30th, right here in my home town of Boulder, Colorado. Find out more HERE! 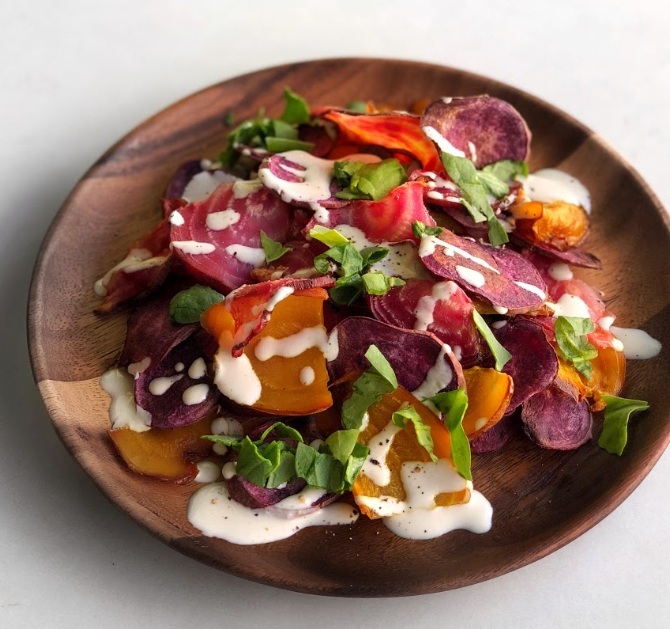 Known for their health-promoting benefits and astonishing nutrient profile, beets have been revered as a healing and anti-aging food in both Ayurveda and traditional Chinese medicine for centuries. This one-pan dish is perfect addition to any Thanksgiving feast. Not only are beets full of health promoting antioxidants and trace minerals, they are also loaded with dietary nitrates––a naturally occurring inorganic compound––that convert to nitric oxide in the body. Beetroot directly support heart health, lowers blood pressure, enhance physical performance, and protects brain cells keeping you feeling healthy and vital. If you like these earthly sweet roots, be sure to add them to your anti-aging diet! You may know celery as a popular addition to soups, stews, and salads. You may not, however, be as familiar with the form of celery (the root) known as celeriac. Don’t let the gnarly and peculiar appearance of celeriac fool you. Celeriac is full of flavor, and a tasty addition to your fall vegetable repertoire. Try these tasty mashers this Thanksgiving (and beyond). Celeriac is rich in minerals such as potassium and phosphorus, which research shows supports healthy bone density. Celeriac is also full of vitamin C, K and B6 making it a nutrient-dense choice with many health benefits including fighting free radical damage––diminishing the damage caused to our cells from sources of toxicity and stress. Plus, let me remind you they are so tasty! My very favorite root vegetable!! Did you know cranberries are often referred to as a superfood? While we tend to hear a lot about cranberries, we sadly don't the rest of the year. This naturally sweetened zesty version of traditional cranberry sauce highlights the health benefits of cranberries without all of the added sugar. 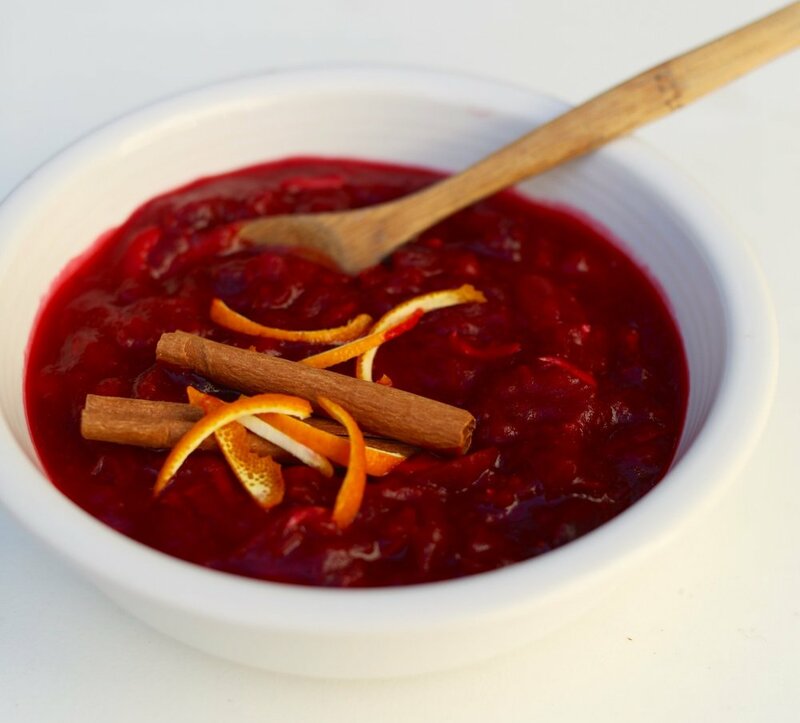 This delicious fall flavored rendition of cranberry sauce has a lot to offer your palate and your health! Cranberries are known to decrease inflammation, prevent UTI’s, protect against cancer, improve cardiovascular health…the list goes on! Enjoy these healthy and delicious treats this holiday season or really anytime at all! Fall flavors are a flowin'. In traditional medicine, the 5 flavors are a representation of the geography of our palates, as well as a larger geography of our lives. Each of the five flavors have their own unique medicinal properties. Flavors attune your body, mind and soul. Subsequently, with our unique body ecologies, we can inquire into the flavors we crave on our plates and how they may reveal some deeper patterns in our lives. Every craving has a message. Sweet: Sweetness is the most nourishing flavor –– all the way from breast milk to a homemade desert. Often a metaphor for love and attention, sweet is the most over eaten and out of balance flavor in our culture. When used wisely, sweetness nourishes the body and heart to the highest degree. Salty: Foods such as sea salt, seaweed and cured cheeses deliver salt to the body. Salt maintains the electrolyte balance in our cells. The salty flavor is said to increase inner courage, drive and fearlessness. Pungent: Foods such as hot peppers, garlic and ginger bring the pungent flavor (also known as spicy). Pungent flavors clear the sinuses and improve circulation. Pungent foods are said to increase passion and excitement. Bitter: Bitter is experienced in foods like kale, spinach and chocolate. Bitter is the flavor most lacking in the Western world’s diet, even though bitter foods often offer the most health benefits and spiritual enhancement. Bitter foods purify and cleanse the body, mind and soul. Sour: Citrus, green grapes and fermented foods such as vinegars and pickles offer the sour flavor. Sour is energizing and supports a strong and healthy digestion. The sour flavor is known to soothe irritability and increase our sense of calm and peace. Often known as the taste of satiation, the combination and balance of all five flavors gives us the feeling of being fed, and being fed well. Notice the foods you crave when you are worried, stressed, irritable, bored, lonely or tired. Which flavors you are drawn to? Which flavors do you shy away from? What do you need to be nourished? I know most of you are busy and on-the-go folks. These make-and-take fall insprired salad jars are both super easy to make (layering included), portable, and seriously fall-lcious. 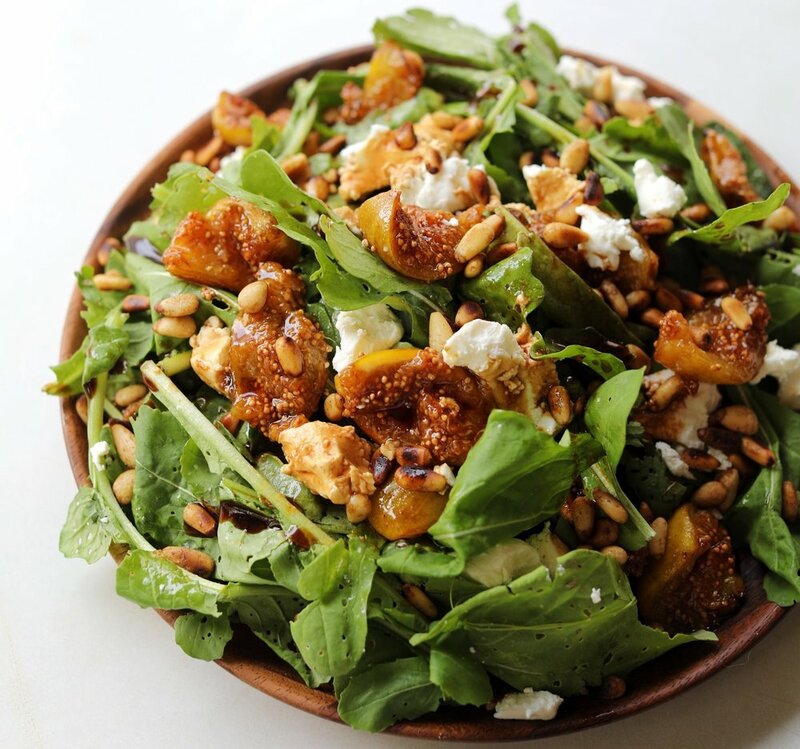 Roasted pears, toasted pepitas, and those yummy root veggies make for a great salad theme. 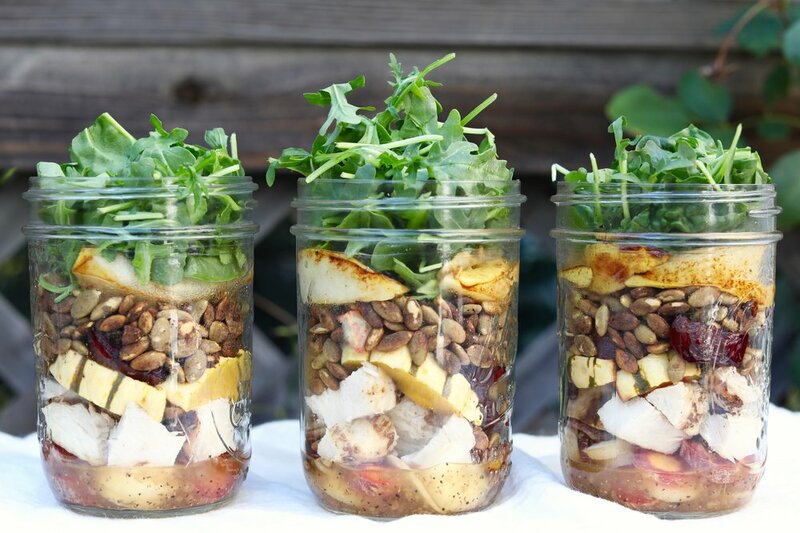 Be sure to take note of the salad jar layering for best keeping and a crunchy fresh salad! Tis the season of root veggies and squash. This medley is simple, quick and full of the diverse flavors of fall. Roast a big pan and keep for munching all week! An heirloom variety of hard-shell squash that is known for its smooth, buttery, and nutty flavor, delicata squash is also low in sugars and high in fiber. Delicata’s unique yellow shell with green stripes makes it easy to recognize alongside its cousins acorn squash, butternut squash and spaghetti squash. Similar to other hard-shell squashes, delicata squash is high in vitamin C, vitamin A, calcium, and iron. Eat it often for a healthy immune system, strong bones, and as anemia prevention (preventing low levels of iron in your blood, which can leave you feeling weak). "COOKING IS LOVE MADE VISIBLE"
This time of year gets me back into the kitchen roasting. A nice merge of roasted figs over a fresh bed of arugula with a garnish or toasted pine nuts and goat cheese is a gentle ease into the flavors of fall. Deeelicious! Did you know that fig leaves were made into clothing for Adam and Eve in the story of the Garden of Eden? Not only that, historically figs have been considered a potent aphrodisiac. I don't know about you, but I'll take some! Part of the mulberry family, these succulent little fruits are full of a healthy sweet flavor full of good fiber and trace minerals such as magnesium, copper, potassium and calcium. Also, take note: Figs get more nutritionally dense when dried (say what?). Feel free to snack on them dried with your favorite nut or seed. Enjoy this delicious late summer salad. A wonderful source of vitamin B12, Nutritional yeast is a deactivated yeast (often a strain of saccharomyces cerevisiae) that makes a great sprinkle on any meal, a topping on your bowl of popcorn or a delicious cheesy sauce. This recipe blends delicious roasted chilies, peppers, black beans and zucchini all tied together with a tasty sauce. "BEHIND EVERY SUCCESSFUL WOMAN IS A TRIBE OF OTHER SUCCESSFUL WOMEN WHO HAVE HER BACK." Do you have a weekly to-do list? I have a gargantuan appreciation for mine: it forges my path for the week; it keeps me focussed; it holds me accountable. Am I resistant to something? Is the timing not right? So, when I told my mastermind group that I wanted to create a new program during our final meeting of 2017, I was expecting things move along as they usually would. With the new year ahead, I felt inspired. However, for a reason unbeknownst to me, the months kept passing and this program was not getting it's weekly check off my to-do list and I could not figure out what was holding me back. A couple months later, my business coach and I sat at my kitchen table over a cup of yerba mate and some spring tulips. She had come over to interview me for her podcast on women entrepreneurs and motherhood. During the recording she asked: "Aren't you about to launch a new program?". Although I still felt somewhat wobbly on when, I quickly responded with a definitive "YES! Yes I am." This was my faith it till you make it moment. Finally, this summer I hunkered down for a 15 hour plane ride home from Bali. Somewhere between Guam and Hawaii, whilst the plane was dark and sleepy, it came to me––a new (and improved) version of this program. Sometimes, we have to trust the process. I created my business, Boulder Nutrition, over 15 years ago from the ground up. Since then I have grown a successful and sustainable business and I have lead over 20 local and international retreats. I am excited to share what I have learned in holistic business and leadership with you! 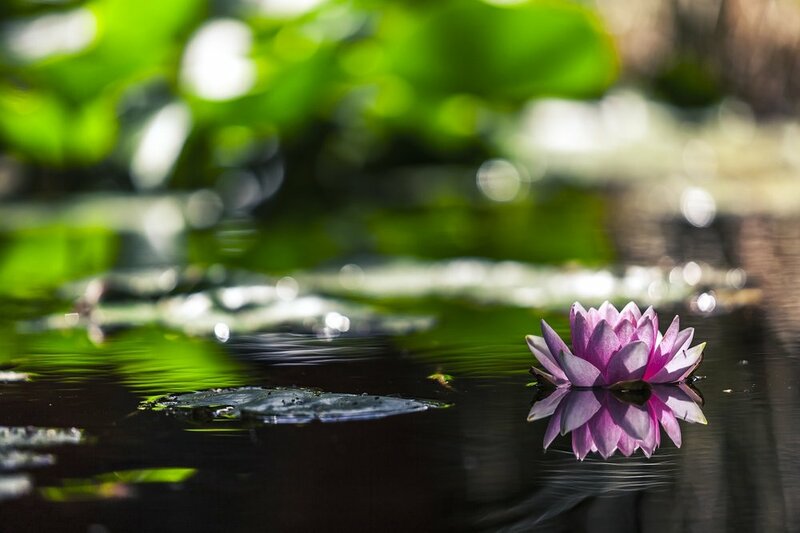 Lotus Leadership is a soulful, empowered, nourishing and supportive approach to business, leadership, aligned action and self-care. Develop and focus your attention and energy on the mission of your business and leadership. Create a healthy rhythm, map your goals and navigate your time and energy sustainably. Align your core values with your business and leadership. Elevate yourself and others to rise in full potential. You don't have to do this alone. I am thrilled to share this journey with you. ARE YOU PART OF THE EPIDEMIC? "ONE WOMAN CAN CHANGE ANYTHING. MANY WOMEN CAN CHANGE EVERYTHING." Do you ever feel like you do it all yourself? Whether it be running your household, taking care of your kids, managing your business or taking care of everybody else but yourself (or all of the above), you are likely part of a major epedemic.. I call it self sufficiency syndrome (SSS). The reason I want to talk to you about this is simple: I too, am in full SSS recovery and oh boy, it's a doozy. For many, H E L P is a four letter word. You would rather do everything yourself so that it gets done "right"
While you may be thinking "I can't always control my life circumstances," what I want to tell you today is that what you can control is how you respond to them. You can do anything, if you stop trying to do everything. Asking for help, delegating and leaning in to support and trust have been a challenging yet monumental practice for me in my personal and professional life. As with any of my deep internal work, I have learned so much about myself in the process. I have also felt uncomfortable, tentative and extremely vulnerable. Don't get me wrong, self-sufficiency can be a blessing––but not when we are left burnt out, fried, overwhelmed and exhausted. Gathering support, in whatever form we need, is an important ingredient for our health and our happiness. ...because I have learned, it takes a tribe. You may have seen them if you follow me on Instagram, as they have been doing some fun and informative #instatakeovers. You may have met them if you have joined (or will be joining) me on any of my local or international retreats. You may have even tried out one of their recipe creations from the Boulder Nutrition recipe page. Either way, each of these three women have become an integral part of my business and I am incredibly grateful for the work we are creating together. 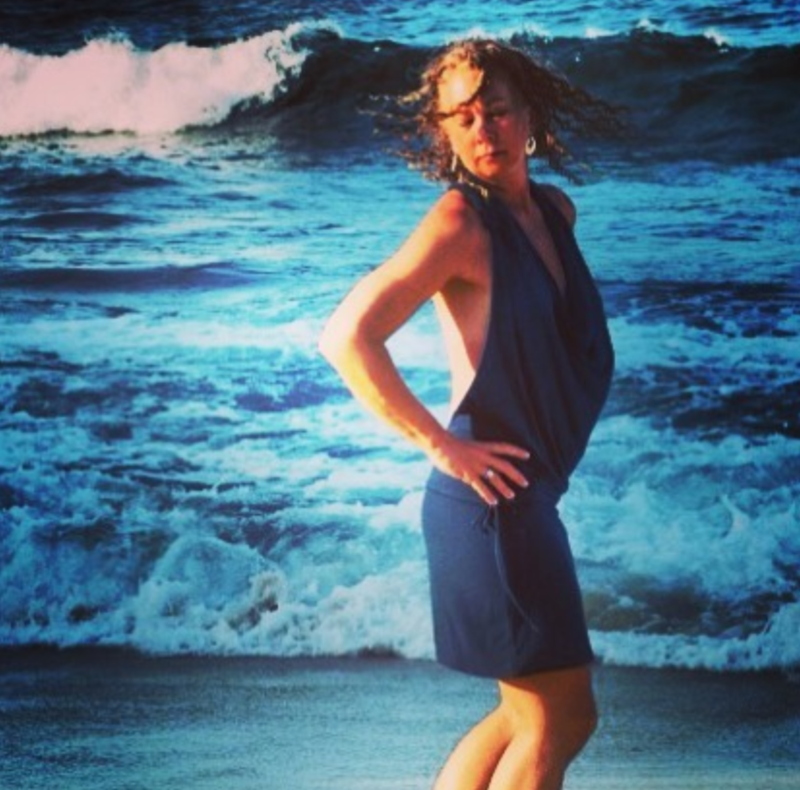 Alana is a student at the Institute for Integrative Nutrition, a yoga instructor and natural baker. 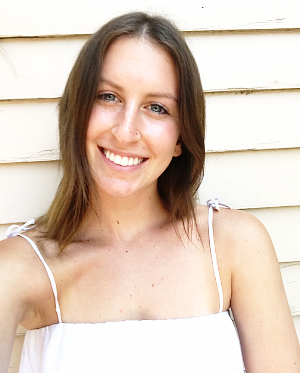 Alana's passion lies in the combination of yoga and nutrition to help women heal negative body image and disordered eating. She brings a bright light and loving heart to many of our retreats. Kristine is in school for her Master Nutrition Therapist degree in Denver. She’s an advocate for functional health care and believes that your whole history is part of your health story. 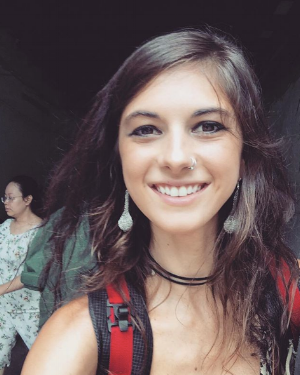 In practice, she wants to specialize in gut health while teaching others the importance of agricultural sustainability and how to properly prepare food for optimal nutrition. If you want to create a healthy and happy life, you need support too. ...Where do you feel supported in your life? ...Where are you overwhelmed, exhausted or feeling alone? ...What is one baby step you can take this week to build your tribe? I would love to hear your responses. Scroll down to comment section and join the conversation. "THE WAY WE DO ANYTHING IS THE WAY WE DO EVERYTHING. THE WAY WE EAT IS THE WAY WE LIVE"
Vegan or Paleo? Gluten free or whole grain? Whole food or fat free? What we “should” eat gets a lot of press these days. We know eating healthy is a great first step, but when it comes to aligning with a particular eating style, there are many factors to consider. Eaters are often left confused around which eating style to choose in order to obtain optimal health and vitality––if choosing any at all. Each of the eating styles below comes with specific health benefits and characteristics that may help you navigate what lands on your plate. o Get your daily exercise. These guidelines are basic, simple and healthful. If you are dealing with specific health issues, you may need to alter the foods within the whole food regimen to address your health more assertively. Gluten free substitutions and health trends have become more and more popular in local health food stores over the past decade. Studies now show that 1 percent of the population has celiac disease (gluten intolerance) and 10 percent of Amercians are gluten sensitive. Grains containing gluten include wheat, spelt, barley, rye, farro, and kamut (along with other grains that may be contaminated with gluten such as oats). While many of us may not be technically gluten intolerant or sensitive (or undiagnosed) eating less gluten can be beneficial for reasons such as decreasing inflammation, improving candida symptoms, healing leaky gut, and reducing migraines. But don’t be fooled, eating gluten free does not guarantee your health. Beware of the ingredients in many gluten free substitutions as they are often refined, high in sugar, GMO’s, or preservatives. 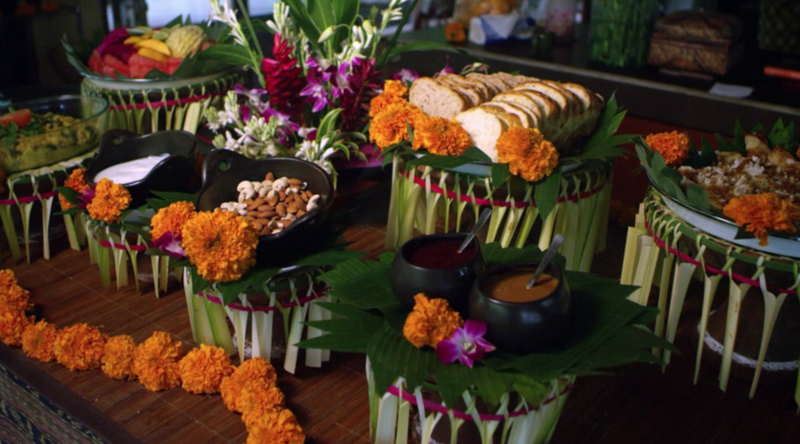 Originally coined by Dr. Weston A Price, the Traditional diet is exactly what it sounds like: Eating the traditional and local food of your climate and culture. In the early 1900’s, Dr. Price travelled around the globe, making the world his laboratory, while he observed many cultures far and wide––from Eskimos to Swiss and African tribes to Polynesian Sea islanders. His research is based on the dental structure and health of these varying populations and how their traditional diets affected physical degeneration related to nutritional deficiencies. His complete body of work can be found in his masterpiece: Nutrition and Physical Degeneration. The Weston A. Price Foundation was created in 1999 to continue his work and research in the world, while also educating folks on restoring nutrient dense foods to the human diet. The Traditional Diet recommends a whole food based regimen based on nutrient dense local foods from plants and animals, with a special focus on nutrient dense foods, such as local cultured butter, local raw milk, farm fresh egg yolks, bone broth, as well as traditional sourdough breads and organ meats. The Paleo regimen is fairly simple: If the caveman did not eat it, then neither should you. The Paleo diet is based on the premise that genetically, we are almost identical to our caveman ancestors. While studies show this premise to be only partially true, this hunter-gatherer type of eating style has many positives. Paleo eaters avoid processed sugar, grains, legumes and dairy. o Eggs, nuts and seeds. While some folks find it meat heavy, studies have shown the Paleo diet has a positive impact on glucose intolerance, weight loss, and cardiovascular health. The Paleo Diet is a highly anti-inflammatory, pure and clean option to check out. Originally created by the medical community as a supportive diet for children with epilepsy, the Ketogenic diet focuses on high fat and protein foods that force the body into a ketogenic state—burning fat for energy instead of the usual glucose and glucose-rich carbohydrates. This eating style surely busts the myth that “fat makes you fat”. The Ketogenic diet has become more widespread recently with various associated health benefits outside of managing childhood epilepsy. While the Ketogenic diet requires more than a little diligence and a commitment and many folks question these drastic dietary changes, studies show that the extended use of the Ketogenic diet has a positive impact on weight loss, body mass index, cholesterol levels (raising HDL and lowering LDL) and blood glucose levels with no noted long term safety issues. With digestive issues on the rise, the low FODMAP diet addresses some of the more common digestive issues of our time and is often recommended because many eaters have trouble digesting short-chain carbohydrates (tiny carbohydrates with less than 10 sugars). FODMAP stands for "Fermentable Oligosaccharides, Disaccharides, Monosaccharides and Polyols”. The result of eating high FODMAP foods can be that these partially digested carbohydrates reach the large intestine and create a fermentation effect. Also, in the gut one’s “bad bacteria” uses these partially digested carbohydrates for fuel, exacerbating digestive issues, leading to gas, bloating, stomach pain and even constipation. While the low FODMAP diet can feel a bit restrictive and challenging at first, studies show this diet to be a very healing option for many who struggle with IBS. You can find a complete list of the high FODMAP foods to avoid here. Whole30 was founded by Melissa and Dallas Hartwig in 2009. Their Motto: Eat. Real. Food. This popular 30-day program is a whole food short-term nutritional reset, governed by a few particular do’s and don’ts. Do’s include eating a real food diet rich in meats, fish, eggs, poultry, natural fats, and spices. Don’ts are to avoid processed sugars (including artificial sweeteners), grains, alcohol, legumes, dairy, MSG, sulfites and carrageenan and processed foods of any kind. While there is no recommended calorie counting or weighing during the program (in fact it is forbidden), weight loss is highlighted as a primary benefit. Whole30 is considered more of a diet than an eating style with it’s 30-day focus on structure, duration, support, and regulation. Michael Pollan said it well: “Eat food, mostly plants.” This is the foundation of the plant-based diet. Plant-based is not as strict as it sounds, with a wide range of plant based foods – vegetables, fruits, nuts, seeds, and legumes and can include small amounts of animal protein. Often confused with the vegan or vegetarian diet, plant-based eating has a foundation of plant-based foods without the strict guidelines. But beware, according to the Harvard School of health: “All plants are not created equal”. Technically fruit juice, potato chips and white bread are plant-based foods but can wreak havoc on your blood sugar and bodily inflammation, while a diet high in leafy greens and whole food based plants can do wonders for health and vitality. If you choose to eat plant-based, be sure to choose your plant-based foods wisely. Veganism is known as a diet and lifestyle (often for ethical and environmental reasons) that excludes all forms of animal products, including all dairy, honey and eggs. When done well, the vegan diet can be sustainable, satiating and create and array of health benefits, specifically lowering body weight, lowering blood pressure, and decreasing the rate of cardiovascular disease. However, not all vegan diets are healthy. Eating vegan requires attentiveness and an understanding that certain nutrients (such as omega 3 fatty acids, vitamin B12, zinc, iodine iron, calcium, and iron) are harder to come by in the vegan world. When eating vegan, it is important to stay away from processed, nutrient-weak foods that lack proteins and fats, instead choosing whole food proteins (in the form of nuts, seeds and legumes) and naturally fat-rich foods that provide a stronger base for nutrition, while in some cases supplementing with nutrients such as vitamin B12. This witty marriage of the two words, flexible and vegetarian, was voted the third most popular diet trends of 2018 by US News. The diet was originally described in the book, "The Flexitarian Diet: The Mostly Vegetarian Way to Lose Weight, Be Healthier, Prevent Disease and Add Years to Your Life," by registered dietitian Dawn Jackson Blatner. Flexitarian eating emphasizes a diet high in vegetables, fruits, nuts, seeds, whole grains, plant-based proteins with occasional animal protein options. The original Flexitarian regimen comes with a supportive menu plan, lots of resources on cooking tofu and other plant-based proteins, and many supportive intentions including pleasure, satiety, and convenience. The Flexitarian diet is just like it sounds, flexible. While this works well for some, others may prefer a bit more structure. There are many versions of eating flexibly and finding the best one for you is important to consider. Finding an eating style that works for you can take a little patience, education and mind-body awareness. In general, when filling your plate with nutrient-dense whole foods, you can be confident that you are getting a high quality nutritious diet. Many of the above eating styles are strong and healthy options that over time, you can customize to align with your health and wellness needs. 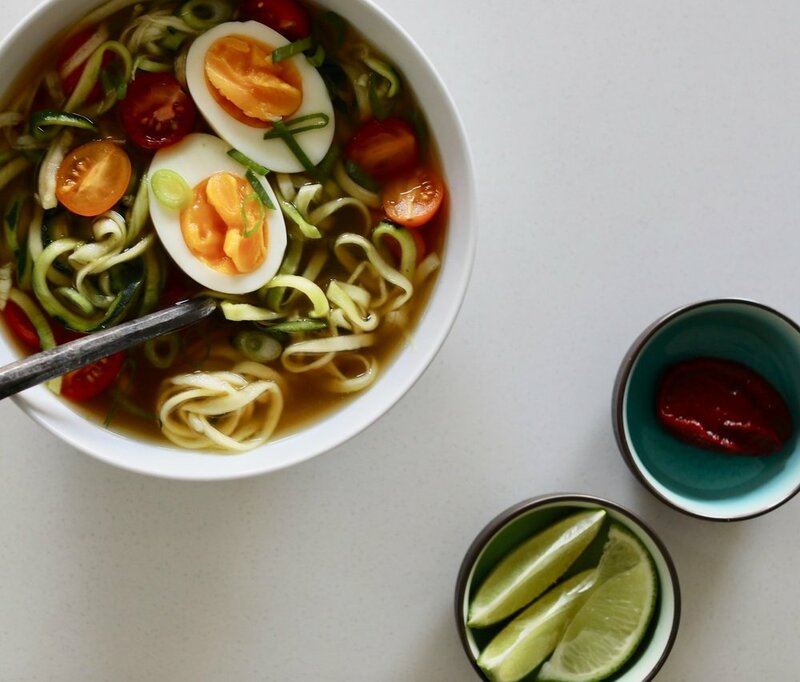 You may not think 'soup' during these warm days and nights, but tropical cultures all over the world enjoy some good 'ol soup at any and all times of year. This one is great for those seasonal carrots that may be growing in your garden and are surely all over the farmers market. Make this with bone broth for a little extra digestive support and healing if you like. It's nourishing and delicious! Eating warm/cooked foods is a bit easier on your digestion as our bodies digest our food at 100 degrees. If you suffer from a week or challenged digestion, this soup is like medicine with all the components: Carrots are so full of phytonutrients, especially carotene. Ginger soothes the digestion, coconut is very antibacterial and antimicrobial and bone broth strengthens the digestive tissue healing and permeability (leaky gut). Feel free to use this recipe as a base for other vegetable bisques. 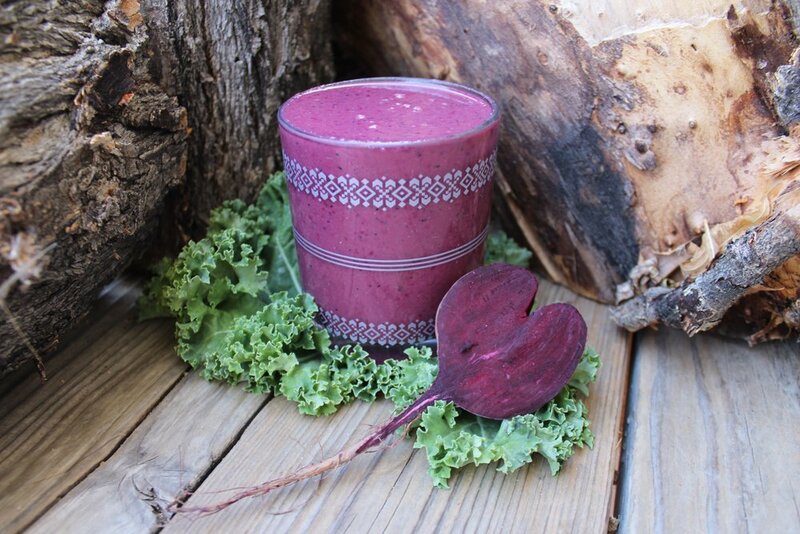 Healing and nourishing down to your cells!